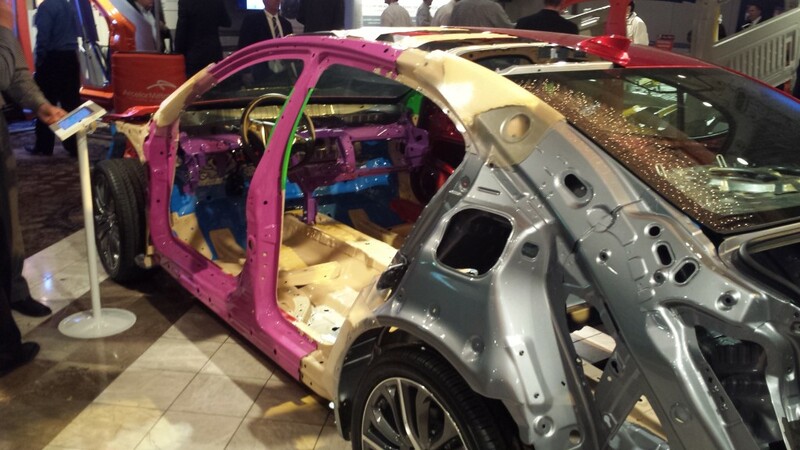 The 2015 Acura TLX, which has recently drawn comparisons in the auto press to the rival 2016 Nissan Maxima, joined the Maxima in revealing its skeleton at the 2015 Great Designs in Steel conference in May. The body-in-white of the TLX is 44 percent 590-megapascal steel (See more diagrams.) — above the 550 MPa point upon which a steel tips officially into the high-strength category — or even stronger. The hood and bumpers are made up of aluminum, and the instrument mount is made out of three pieces of magnesium. The magnesium instrument panel only weighs 13.2 pounds, 2.2 pounds lighter than it had when it was a more complicated, 26-part aluminum and steel piece. 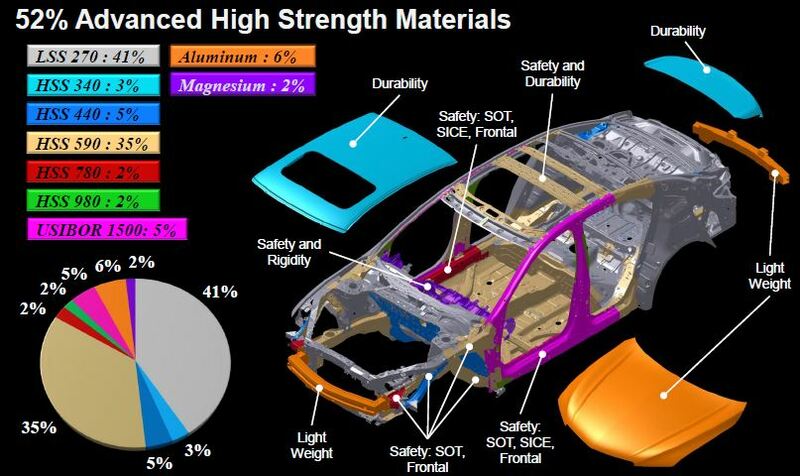 The hot-stamped door ring first used in the Acura MDX was applied to the TLX here, making for a super-strong, 1,500 MPa structure with which repairers will have to contend. 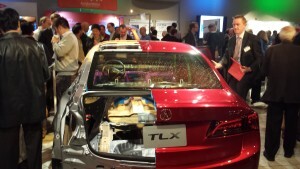 Part of the rationale between the TLX’s sturdy design was the advent of the small-overlap crash test, which Madsen called a “game-changer” for the OEMs. Unfortunately, the car only achieved an “acceptable” Insurance Institute for Highway Safety rating in that category while the 2014 Acura TL took “good” ratings across the board, according to Madsen. Ironically, the 2015 TLX did surpass its four-star predecessor to get five stars overall from the National Highway Traffic Safety Administration. The TLX’s robust design yielded another interesting safety tidbit: Its roof can support 5.67 times the car’s weight before it’s compressed five inches, should you be unfortunate enough to roll the car. 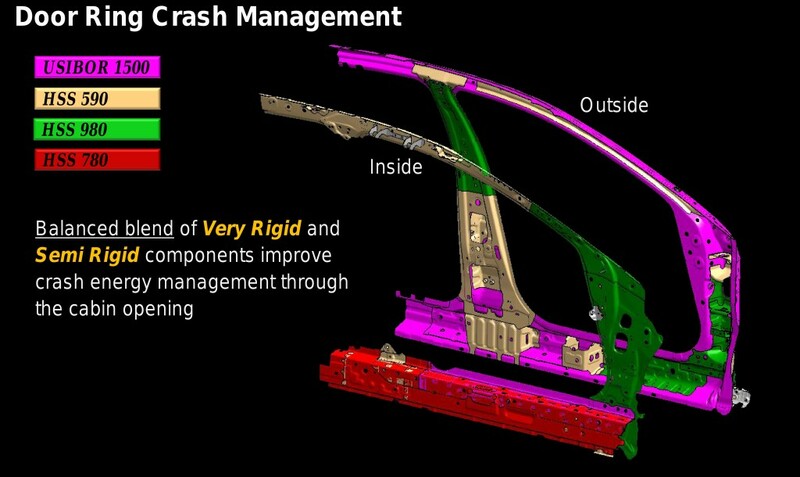 The IIHS only requires 4 times the weight, prompting an audience member to ask if the TLX’s apparent roof crush overengineering would be reduced to save weight. According to Madsen, Acura didn’t even plan to make the car able to withstand that force, it just happened as a byproduct of its engineering for other crash tests. 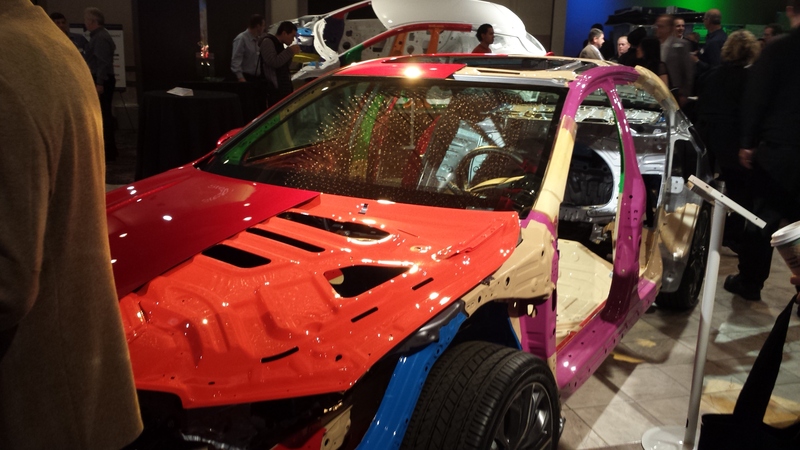 Though it added weight back in “key performance areas” for crumple zones and stiffness, the TLX as a whole weighs more than 55 pounds less than the TL, according to Madsen.